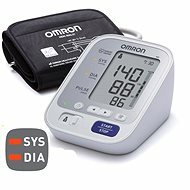 The OMRON RS3 is a highly-reliable and practical blood pressure monitor, providing accurate measurements every time! It comes equipped with an Intellisense wrist cuff, allowing for the automatic and rapid inflation required to obtain precise measurements. To enhance accuracy further, the OMRON RS3 utilises a dual measurement mechanism, taking an initial measurement during inflation and a secondary measurement as the valve releases pressure. If the cuff is attached incorrectly or inappropriately, a notification will appear to warn you. Additionally, if the user is moving during the acquisition of measurements, the intelligent monitor will inform you of such. One of its main advantages is its ability to detect cardiac arrhythmia—you can always have peace of mind with the OMRON RS3. 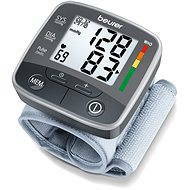 The blood pressure monitor comes equipped with a large, easy to read LCD display, allowing for good visibility. It is able to obtain systolic and diastolic measurements, as well as your heart rate. If your blood pressure is particularly high, an alert will be emitted—you don’t need to cross reference with recommended values anymore. 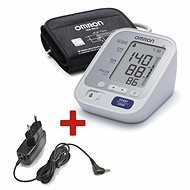 Additionally, instead of having to record each of your measurements, you can refer to the OMRON RS3’s internal memory, which stores the 60 previous values for you. These include date and time stamps, allowing you to obtain a comprehensive overview over an extended period of time. The device is power by 2 AAA batteries, which are included in the package so that you can begin using it straight away! They are high-quality alkaline, lasting up to 300 measurements. For shipping to other EU countries visit this page OMRON RS3. Für Versand nach Deutschland, besuchen Sie bitte OMRON RS3. Chcete doručit zboží do Česka? Prohlédněte si OMRON RS3. Chcete doručiť tovar na Slovensko? Prezrite si OMRON RS3. Für Versand nach Österreich, besuchen Sie bitte OMRON RS3. Magyarországra történő kiszállításért tekintse meg ezt a termékoldalt: OMRON RS3.